In the words of Lee Child on Gone to Dust, "I want more of Nils Shapiro." 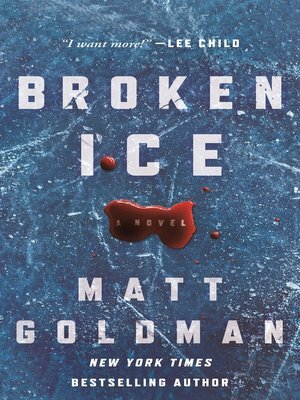 Emmy-award winning and New York Times bestselling author Matt Goldman happily obliges by bringing the Minneapolis private detective back for another thrilling, standalone adventure in Broken Ice. Nils Shapiro has been hired to find missing Linnea Engstrom, a teenager from the small northern hockey town of Warroad, MN. Most of Warroad is in Minneapolis for the state high school hockey tournament, and Linnea never returned from last night's game. Linnea's friend Haley Housch is also missing—and soon found dead. Shot through the arm with an arrow at the Haley Housch crime scene, only the quick work of medical examiner Char Northagen saves Nil's life. Nils should be in the hospital recovering from his near fatal injury, but he knows that the clock is ticking. Linnea could be anywhere, and someone doesn't want her found. Is Linnea a victim, or is she playing a dangerous game? As bodies start piling up, the clues lead Nils and Ellegaard north to Warroad, a small, quiet town with many secrets to hide.